What better time to reminisce about my childhood summers at the beach than during winter; with icy wind blowing and rain slapping the decking outside my office window. Summer holidays would start in earnest after the bedlam of Christmas had concluded. Family, food and Father Christmas having sated our hunger for all things merry would leave us reeling on Boxing Day in a sugar induced state of delirium. My parents would assume a defensive formation as my brother and I terrorised them, unsure what to play with and what to focus our energy on. Wizz Fizz and a need for batteries would invariably be the goal. Searching throughout the house for a power source to use in a newly acquired toy, smacking powdered sugary lips with satisfaction when found. Television and video remotes would unexpectedly cease to function. The camper trailer packed, the car brimming with bags, towels and toys. It was time to go when the back of the Falcons suspension had bottomed out. A surge of adrenaline would course through my body as my brother and I were buckled into the car. Mum would do “one last check” of the house; and we were away. The trusty sound of steel scraping on concrete reassured as we departed the driveway and hit the open road. The journey to Rosebud was a short drive in a slow car, held up by the many holiday makers migrating slowly down the Nepean Highway. Time was spent split between reading comic books and staring out the window at the blur of gum trees. Imagining the possibilities and adventures awaiting us on our three weeks spent among the tea trees. I knew we were getting close when the green cyclone fencing that ran along the left hand side of the freeway would appear. This simple green fence meant more to me on the drive than anything else. It signified our imminent arrival at the beach, a quick turn, acceleration up a short rise, greenery parting like curtains for blue vivid waters. 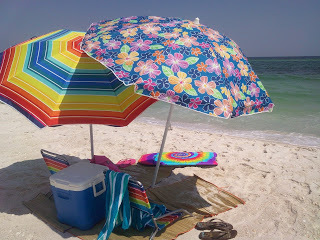 Glimpsing a sliver of beach, bright umbrellas manning the waters-edge, my seatbelt taught as I strained against it. Families would be out in force along both sides of the road as we drove slowly through Dromana and McCrae on approach to Rosebud. Heading to the pub for lunch or Kmart and Coles for supplies, everyone seemed to be camping along the foreshore. This created a community spirit I have not experienced since. Children zig-zag along footpaths with parents following behind like sheep dogs corralling their charges. A man trundled by walking his dog whilst balancing a slab on his shoulder. Smiles came easily to everyone, tension from a year of work and Christmas seemed to melt away near the water. Whatever personal dramas you were experiencing were put on hold until you were on the road back to Melbourne. Passing the Lighthouse and mini golf courses, I would imagine myself there in the coming days. Children stood outside the Australian Ice Creamery with devilish smiles, ice-cream running between fingers and down arms. Turning down a sandy track that was indistinguishable from the many others along the foreshore, we would enter the tea trees to set up camp. Our routine was the same each year, having pre-booked four powered sites some six months prior. We would choose one of the four, generally whatever was left as our friends would have already arrived and be in the midst of erecting tents and caravans. My family would perform an emu parade from one end of the site to the other. Picking up and disposing of Banksia pods, rocks and branches that were scattered across our site. They would go as far as the next site as they were hurled unceremoniously over our shoulders. Once the camp floor was clear of obstructions Dad would back the camper trailer into position. A “Jayco Swan” which was a wondrous hybrid of tent and caravan camping, it didn’t resemble a swan at all more like a transformer halfway through transformation. Green shade cloth would be rolled out covering the ground between sites. My brother and I would drive tent pegs in to pin it down. When finished our combined camping area mimicked a circle of wagons with a common area in the middle. All kept undercover by a series of tarps strung up in a most haphazard fashion. The walk to the beach was a short hike, past other camp sites and the toilet block. Each block had a male and female section as well as a laundry. In those days they were operated using a token system for hot water. A narrow track ran alongside the toilet block leading to the beach. Over a small sand dune that was overgrown with tea trees and thick climbing vines you would emerge onto the beach. It was not an attractive beach being rather narrow and strewn with seaweed. You couldn’t go for a swim when the tide was out unless you were prepared to wade through 50 metres of sea grass and jelly fish to the deeper water. One plus was the sand bars that appeared with flat hard sand, ideal for beach cricket. Nothing is more enjoyable than striking a tennis ball cleanly out over open water. The bowlers head snapping back as he tracks the ball in flight. Blue sky and sunshine overhead warming the water; an outfielder splashes down diving in desperation for a one handed grab. The stumps had never been bigger with a boogie board and an esky standing vigil at either end of the pitch. AC Cola was consumed in copious amounts. Each slurp from the can would be accompanied by a salty finish, sea salt on parched lips. Despite the less than photogenic beach front it attracted people in there thousands due to the magic of discovery that happened on a daily basis. Whether it was smiling at a pretty girl in a bathing suit or flying a kite in strong winds. Reading a book from front to back in one sitting; just you a beach towel and the sun to keep you company. These things didn’t happen at home, there was never enough time in the day to enjoy something so simple. When the weather turned, which it invariably would, we would walk or ride down to the mini golf course. If we were lucky you would sink a hole in one on the last hole and would turn around and play 18 holes again. Having become a master of the Windmill and Pirate Ship holes you were guaranteed a day of fun. If golf wasn’t your thing the Daytona machines were there waiting for a four man race. Teaching kids throughout Australia how to drive with one foot on the brakes and the other firmly planted on the accelerator. A trip to the arcade was never complete until you had teamed up with your best mates to obliterate some beach bums in Zone 3. The ultimate in simulated warfare for ten year olds, looking like something out of Alien, we played with the utmost seriousness. The late-eighties and early-nineties was a time when men thought nothing of wearing threateningly short shorts. Two stripe track suits and happy pants were the order of the day and hyper colour t-shirts helped monitor the propensity for body odour. Parachute track suits dominated the over 40’s and we as hip youngsters wore board shorts instead of speedos. We were the first generation of children to shun the budgie smugglers. Although secretly everyone still wore their speedos under their shorts. Parents and grand-parents continued to buy them despite never seeing you wear them. The Mornington Peninsula in the eighties and nineties resembled a poor man’s version of the French Riviera. Men and women over the age of sixty would sit in the sun wearing little or no clothing. The sound of sizzling was not that of the many snags cooking on BBQ’s along the beach but the skin of elderly Australians slowly desiccating. This was before the message “slip, slop, slap” had fully taken hold. The most successful part of the “slip, slop, slap” campaign was introducing the legionnaires hat to school children. Never before have mullet hats been so popular. As a child you weren’t sure how to treat this baseball hat crossed with a handkerchief. If you were cool you would try to hide the flap. The early hats came with little Velcro pads which allowed you to roll up the back and affix in place. A burnt neckline became a badge of honour. The summer beach holiday is as Australian as a bindi eye in your sock. It helped shape who I am today and has provided me with many memorable moments. I learnt to be a strong swimmer at Gunnamatta, became an avid fisherman on both the back beaches and Rosebud Jetty. Sailed catamarans on the bay and rode my bike everywhere, I can’t recall ever being fitter. I read my first novel on the beach and haven’t stopped turning pages since. With each successive year I continued to look forward to the holidays. After thirteen summers spent at Rosebud my last trip was as an eighteen year old driving myself down the highway in search of that green cyclone fence. Posted in Articles, Words and tagged 1980s, Beach, Christmas Holidays, Dromana, McCrae, Rosebud, Summer holidays, Victorian beaches. Bookmark the permalink.